The cover art for Arcana was done by Twin Cities underground artist and musician Courie Bishop. 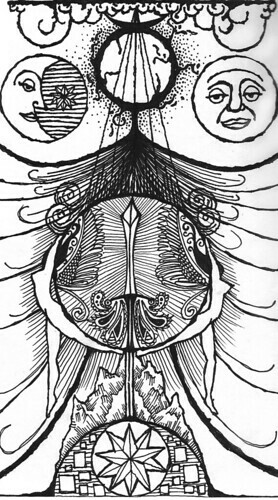 The original drawing shown here is done in the style of alchemical woodcuts from the Renaissance, which is the era during which the Guild was supposedly founded. Also note the balance between Sun and Moon, the silhouettes of the two women, and the central dagger – all of which play important roles in the story. You can view more of Courie’s artwork and photography on her Flickr photostream and listen to her music on her MySpace page.